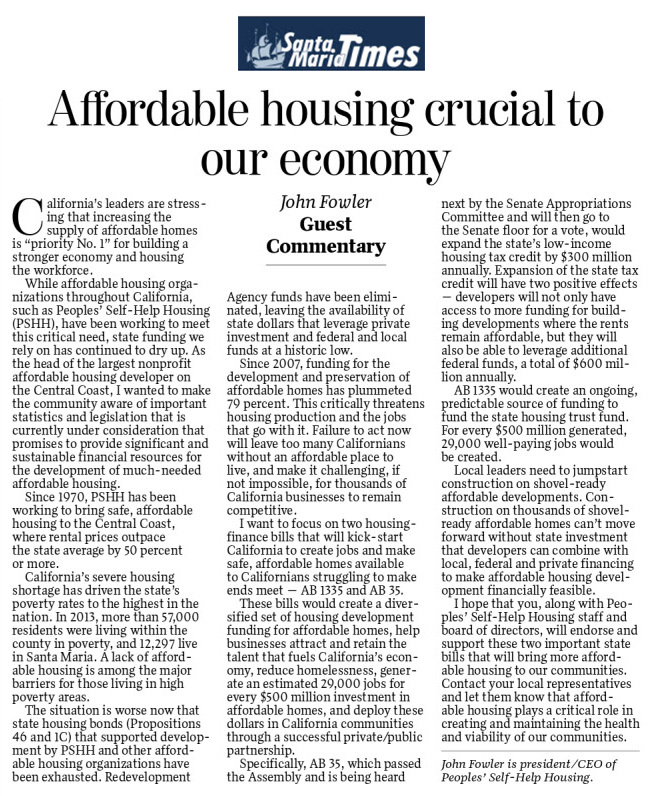 California’s leaders are stressing that increasing the supply of affordable homes is “priority No. 1” for building a stronger economy and housing the workforce. While affordable housing organizations throughout California, such as Peoples’ Self-Help Housing (PSHH), have been working to meet this critical need, state funding we rely on has continued to dry up. As the head of the largest non-profit affordable housing developer on the Central Coast, I wanted to make the community aware of important statistics and legislation that is currently under consideration that promises to provide significant and sustainable financial resources for the development of much-needed affordable housing. Since 1970, PSHH has been working to bring safe, affordable housing to the Central Coast, where rental prices outpace the state average by 50 percent or more. California’s severe housing shortage has driven the state's poverty rates to the highest in the nation. In 2013, more than 57,000 residents were living within the county in poverty, and 12,297 live in Santa Maria. A lack of affordable housing is among the major barriers for those living in high poverty areas. The situation is worse now that state housing bonds (Propositions 46 and 1C) that supported development by PSHH and other affordable housing organizations have been exhausted. Redevelopment Agency funds have been eliminated, leaving the availability of state dollars that leverage private investment and federal and local funds at a historic low. Since 2007, funding for the development and preservation of affordable homes has plummeted 79 percent. This critically threatens housing production and the jobs that go with it. Failure to act now will leave too many Californians without an affordable place to live, and make it challenging, if not impossible, for thousands of California businesses to remain competitive. I want to focus on two housing-finance bills that will kick-start California to create jobs and make safe, affordable homes available to Californians struggling to make ends meet — AB 1335 and AB 35. These bills would create a diversified set of housing development funding for affordable homes, help businesses attract and retain the talent that fuels California’s economy, reduce homelessness, generate an estimated 29,000 jobs for every $500 million investment in affordable homes, and deploy these dollars in California communities through a successful private/public partnership. Specifically, AB 35, which passed the Assembly and is being heard next by the Senate Appropriations Committee and will then go to the Senate floor for a vote, would expand the state's low-income housing tax credit by $300 million annually. Expansion of the state tax credit will have two positive effects — developers will not only have access to more funding for building developments where the rents remain affordable, but they will also be able to leverage additional federal funds, a total of $600 million annually. AB 1335 would create an ongoing, predictable source of funding to fund the state housing trust fund. For every $500 million generated, 29,000 well-paying jobs would be created. Local leaders need to jumpstart construction on shovel-ready affordable developments. Construction on thousands of shovel-ready affordable homes can’t move forward without state investment that developers can combine with local, federal and private financing to make affordable housing development financially feasible. John Fowler is president/CEO of Peoples’ Self-Help Housing.